Save dialog shows compatibility issues when applicable Thanks to Ell, the Gradient tool now supports multi-color hard-edge gradient fills. 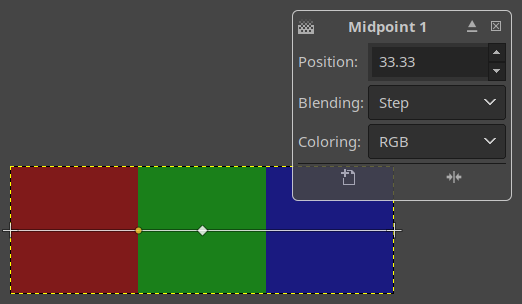 This feature is available as a new Step gradient-segment blending mode. This creates a hard-edge transition between the two adjacent color stops at the midpoint. Newly added Step blending in gradient fills On the usability end of things, all transform tools now apply changes when you save or export/overwrite an image without pressing Enter first to confirm changes. Ell also fixed the color of selected text which wasn’t very visible when e.g. renaming a layer. Much like CIE LAB, this color space is a derivative of CIE XYZ. The Y channel separates luminance information from chromaticity information in the x and y channels. You might be (unknowingly) familiar with this color space if you ever looked at a horshoe diagram of an ICC profile. CIE xyY is useful to explore varios color-related topics like the Abney effect. See this Pixls.us thread for an example of what people do with this kind of information. Well, this may change! A few days ago, WebP reached support in all major browsers (Mozilla Firefox, Google Chrome, Microsoft Edge, Opera), when a 2-year old feature request for Mozilla Firefox got closed as “FIXED”. This will be available for Firefox 65. Therefore, we sure hope web platforms will take this new format into consideration, and that everyone will stop creating GIF images now that there are actual alternatives in most browsers! A WebP animation (done in GIMP), by Aryeom, featuring ZeMarmot and a penguin. Disclaimer: the GIMP team is neutral towards formats. We are aware of other animated image formats, such as APNG or MNG, and wish them all the best as well! We would also be very happy to support them in GIMP, if contributors show up with working patches. Given quickly approaching winter holidays and all the busy time that comes with it, we can’t 100% guarantee another stable release this year, but we’ll do our best to keep’em coming regularly!